GoJS is a flexible library that can be used to create a number of different kinds of interactive diagrams, including data visualizations, drawing tools, and graph editors. There are samples for flowchart, org chart, business process BPMN, swimlanes, timelines, state charts, kanban, network, mindmap, sankey, family trees and genogram charts, fishbone diagrams, floor plans, UML, decision trees, pert charts, Gantt, and hundreds more. GoJS includes a number of built in layouts including tree layout, force directed, radial, and layered digraph layout, and a number of custom layout examples. 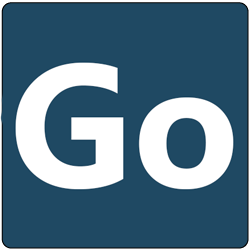 GoJS is rendered with an HTML Canvas element (with export to SVG or image formats). GoJS can run in a web browser, or server side in Node or Puppeteer. GoJS Diagrams are backed by Models, with saving and loading typically via JSON. This repository contains both the library and the sources for all samples, extensions, and documentation. You can use the GitHub repository to quickly search through all of the sources. 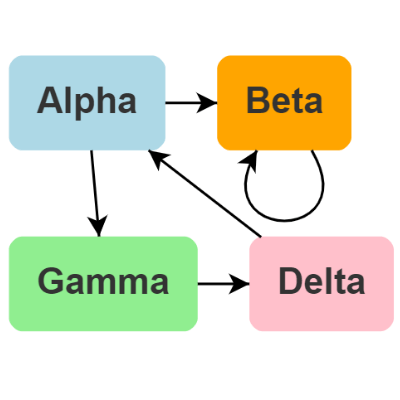 Graphs are constructed by creating one or more templates, with desired properties data-bound, and adding model data. The above diagram and model code creates the following graph. The user can now click on nodes or links to select them, copy-and-paste them, drag them, delete them, scroll, pan, and zoom, with a mouse or with fingers. Northwoods Software offers a month of free developer-to-developer support for GoJS to help you get started on your project. Read and search the official GoJS forum for any topics related to your questions. Posting in the forum is the fastest and most effective way of obtaining support for any GoJS related inquiries. Please register for support at Northwoods Software's registration form before posting in the forum. For any nontechnical questions about GoJS, such as about sales or licensing, please visit Northwoods Software's contact form.